Home » india news » Kolkata gets a Saint. Is redemption still far away? Mother Teresa who worked undyingly for the poor of Kolkata has now become 'Saint Teresa of Calcutta'. Her monumental work was far beyond the imagination of the world which just couldn't understand the enormity of its selflessness. So it is was a foregone conclusion that she wouldn't be allowed to go, just like that, as a mere mortal. Her canonisation on Sunday, 4 September by Pope Francis at a glorious ceremony at Bernini's colonnade in Vatican, a complex surrounded by 284 columns, 88 pilasters surmounted by 162 statues each 12 feet high, was something befitting the gods. In fact, by being named a Saint, the nun of Park Circus in Kolkata will join a pantheon of Catholic saints who are equal to the gods and to whom millions will pray for a cure, for just that one miracle that will change their lives. Millions of statues of Teresa will come up in nooks and corners around the world and people will place candles at its feet in reverence. The wax from the melting candles will look like mysterious gargoyles reaching out for succour. Teresa's canonisation was fast tracked and comes just 20 years after her death, which is a record of sorts. Popes were in a hurry to get into the act and appropriate Mother Teresa. In 2003 she was beatified as Blessed Teresa of Calcutta by John Paul II and now comes the canonisation. This fast tracking was required most desperately by the Catholic church, fast running out of a rationale to address the new generation, increasingly moving away from the church and religion in the developed world. In Britain, a recent survey showed that half the population were non-believers or atheists. Same is the case in other countries like the US and smaller European states where the marvels of technology and science and good old materialism, is convincing the younger generation that god lives in their very palms. In the mobile phones they hold and click every minute or in the bigger computers on their desk. Virtual reality had become the new miracle. After death, Mother Teresa will have to bear a heavier burden than the one she did when she was alive. For her looking after the poor meant everything. She left the catholic order of the Sisters of Loreto, in September 1946, because she got a second calling from Jesus while on a train to Darjeeling that she serve the poor. At that point, the Catholic church was not too keen on her serving the poor, for the church was busy saving souls. It can be debated, but the 'second calling' can be interpreted as a rebuff to the church itself. No priest or nun gets a 'second calling'. When she walked out of the Loreto convent, it was a great rebellion. It questioned the very theological basis of the church. The Missionaries of Charity, which was established outside the narrow confines of the church, was created with just the humble intention of looking after the poor. The church in Calcutta was least bothered. The question here is why wasn't she allowed to work for the poor as a Loreto sister? However, seeing her work, the church was quick to first appropriate the Missionaries of Charity in 1965, when it was conferred the Decree of Praise by Pope Paul VI. Pope Francis now becomes the third pope to appropriate Mother in some way or other. Little did the church imagine that this former Loreto sister would transform her private church into one bigger in fame and sanctity than the Church itself. By the time of her death in 1997, there were over 4.000 units of Missionaries of Charity throughout the world and clearly, it had become a mighty church in itself. The canonisation of Teresa by which the Catholic Church appropriated someone whom they let go itself is thus full of ironies. "Where is my Faith - even deep down right in there is nothing, but emptiness & darkness - My God - how painful is this unknown pain - I have no Faith - I dare not utter the words & thoughts that crowd in my heart - & make me suffer untold agony," she wrote in a letter to a confidante. This distancing could have happened only because she lived with the poor and saw their suffering every day. Where was a god if suffering was so painful and endless? She wasn't often seen with priests and bishops - all of them were dying to be seen with her. Mother Teresa clearly would not have approved of anything happening in her name because for her, caring was everything, and the poor were her many gods. She often said that she belonged to Jesus but he had clearly turned her back on the church and by the 70s she was more popular than the Pope in power. During the '70s and '80s, the Catholic church was facing its greatest dilemma as young priests around the world rebelled against authority and the church, which had clearly forgotten the poor. Liberation Theology, with its roots in Marxist thought, swept through like a tsunami in Latin America and Asia. At the crux of this was the question of faith and social justice. Mother Teresa was positioned exactly at this fault line of Catholic theology. She walked that tightrope perfectly but never wavered in her belief that it is the poor who mattered and that the faith and the church can wait. But unlike her, Cardinal Ratzinger (later Pope Benedict who resigned and made way for Pope Francis) who headed for many years the Congregation of the Doctrine of the Faith, which preserves the theological purity and direction of the church, along with Pope John Paul II completely crushed the movement by sacking priests. The church moved to the right and also played a political role is dismantling communist governments around the world. Now Pope Francis is taking the church Leftward again, often talking about poverty and social justice. He recently criticised priests and bishops for going around in luxury cars. So, for him to canonise Teresa may be also an attempt to bring he church's focus back on social justice. Again ironically, the very name and image of Saint Teresa of Calcutta will only reemphasize Calcutta as a city of the poor. India and its pretensions of modernity and an economy shirking itself out of its slumber, will not matter as much as the image of Teresa holding a dying beggar, which will remain an abiding image globally, to millions, now. Those pictures will be pasted on every wall in the boulevards of the rich as well as the favelas of Brazil. In such an iconography, an India which is trying to shake off its dirty, poor image will have no place. A large Indian contingent going to Vatican may be all right, but in the eyes of the world, India is back again to be being desperately poor - a country where miracles are needed. It also must be remembered that throughout Mother Teresa's time, thousands from the First World came to Calcutta. Not to ride its trams from Tollygunge to Park Circus, nor to saunter awhile near the Victoria Memorial. They came to unload their collective guilt by holding Kolkata's dying poor in their arms as if to lessen Teresa's burden. They all spent a few days with the nuns of Missionaries of Charity and then flew back. From this week on they will all descend on Kolkata to pray for miracles at Nirmal Hriday. 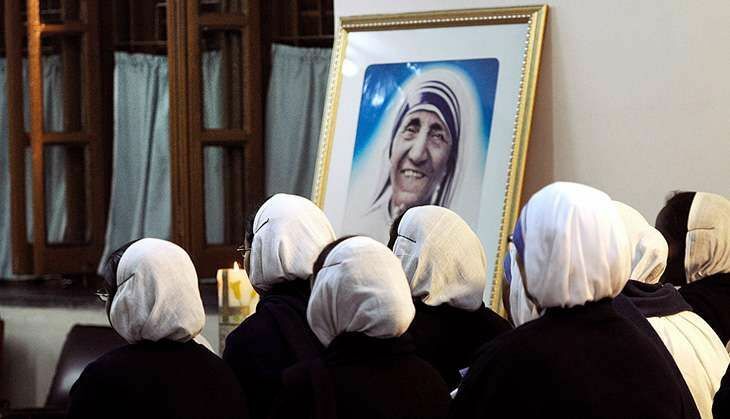 , Kolkata got a global mother, a Nobel Peace prize and now a saint that resides with the gods. Kolkata, and Bengal, had given India its first Nobel Prize too. But that one was for literature. This one was not for imagination or creativity. This one was for caring. Now Kolkata has to bear the weight of a saint as well. All its glitzy medals may mean nothing when you go abroad and see, plastered on the church walls, the picture of its poor and dying. It is in the name of those very poor, whom I have seen dying on the streets in the 80s as I walked past trying to camouflage my terrible guilt and helplessness, that the Marxists too came to power. They did not start any hostel for the dying. They talked about living honourably. They too have been retired honourably now but not before they decorated themselves as saviours of the poor. For them, there was no Vatican. In Kerala, too where the Marxists promised to rescue the poor from their destiny, two priests have already been canonised and a third is awaiting her call. Here too, miracles have become a big business. Vatican had usurped Kerala's poor as well. Among all the many saviours of Kolkata who issued clarion calls, the many prophets who painted a bright future, its many great writers and filmmakers who made poignant award-winning films, one nun lived and cared and thus changed the way the world looked at the poor. On her frail, bent shoulders have now fallen another responsibility. Of delivering miracles.